Registrations are opened again ! Our computer program ARIA (Ambiguous Restraints for Iterative Assignment) is a software for automated NOE assignment and NMR structure calculation. It speeds up and automatizes the assignment process through the use of an iterative structure calculation scheme. 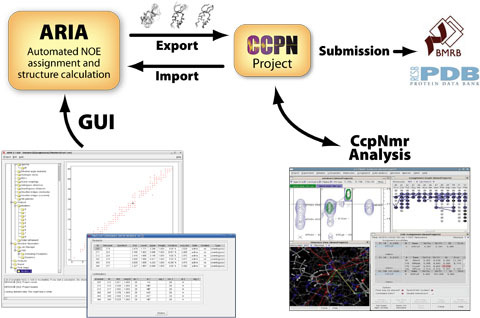 Additionally, a refinement in explicit water improves the quality of the calculated structures, validation tests help spectroscopists to judge the quality of the final structures, and the support of the CCPN data model simplifies the exchange of information with other NMR software packages. ARIA comes with a free academic license. In order to download ARIA, you first need to register as a member of the ARIA web site. To do so, please click on the link "register", located at the top right which redirects you to the join page. After filling in the registration form, an e-mail is automatically sent to you. To activate your account, please follow the instructions given in the e-mail. Once you have logged in to the ARIA site, you can access the section "Download" located in the main navigation menu on the left.